I still have a cooked vegan meal on most days as well. I chop and peel and spiralize fruits and veggies every single day, several times during the day. 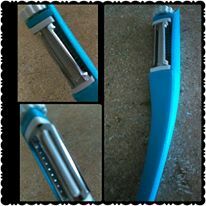 I have this new #MLVOCpeeler, as shown in the pictures above, that I have been using. It's a lovely blue and white, and has multiple blades that you can cycle through. There is a white knob on the top that you can turn, with some effort, and then use it on your food. I do find it a little tough to turn and wish it was a little easier, but once it is turned to the setting that I want, it slices through those carrots, apples, potatoes, etc. with such ease. It's blades are sharp, it does a great job, it makes me wonder why I never knew about it sooner. You can use it to peel or julienne beautifully. It fits into my hand just right too. Get your own here on Amazon. Disclaimer: I received this product in exchange for my honest review.